For more than four decades, Spanish culture and creativity were disrupted by military juntas in the 1920s, the civil war in the 1930s and the horrors of the Franco’s fascist regime that continued into the late 1970s. Yet, Spanish art , literature and architecture gave us some of the greatest works of the last century, with artists such as Pablo Picasso, Salvador Dalí and Joan Miró, poets like Federico García Lorca, and writers like Víctor Alba. When Barcelona began to expand in the late 19th century, there a burst of fresh architectural energy in the Modernista movement, which broke with past styles. The leading light in this movement is Antoni Gaudí, whose work mixes traditional architectural styles with the new, and are a precursor to modern architecture. His most famous and best-loved work is the still-unfinished La Sagrada Família. Other notable Catalan architects in Barcelona at the time includes Lluís Domènech i Montaner and Josep Puig i Cadafalch, although their contribution to the Modernista movement is largely linked to Neo-Gothic works. Sagrada Família has been under construction since 1882, and has been a controversial building since work first began. It is one of the most popular tourist attractions in Barcelona and in Spain and is regarded as Gaudí’s masterpiece. Like many of my generation, I was strongly influenced in my teenage years by George Orwell’s account of the Spanish Civil War, Homage to Catalonia. But when I was in Barcelona for an Easter Basilica of Sagrada Família was the one place I truly wanted to visit. This towering church is often mistakenly identified as a cathedral. But Barcelona’s cathedral is a Gothic building dating from the 13th century, while Sagrada Família is a church without a parish, a basilica that is still being built and that is funded privately. Sagrada Família was the inspiration of a Barcelona bookseller, Josep Maria Bocabella. Following a pilgrimage to Rome and Loreto, he founded the Asociación Espiritual de Devotos de San José (Spiritual Association of Devotees of Saint Joseph), and started raising funds to build a basilica in Barcelona’s new, expanding suburbs. Francesc de Paula del Villar was appointed the architect when the first stone was laid in 1882. He planned a Gothic Revival church of cathedral proportions, but after many disagreements he resigned a year later in 1883, with only the apse crypt complete. Bocabella then turned to Antoni Gaudí (1852-1926) to complete the building. Gaudí was still only 30 and he was certainly an unusual choice at the time; yet he would become Spain’s most celebrated architect. No-one could hardly have realised that he would take the building project in such amazing directions … or that he would never live to see the work completed. Gaudí was born on 25 June 1852. The poor health he suffered as a child shaped his later reticent and reserved character, but also gave him time to study shape and form in nature. Gaudí’s first project was designing lampposts for the Plaça Reial in Barcelona. But his first important commission was the Casa Vicens. At the Paris World Fair in 1878, he impressed the Catalan industrialist Eusebi Güell, who commissioned some of Gaudí’s most outstanding work, including the Park Güell (Güell Park) and the crypt of the church of the Colònia Güel. When Gaudí took over at Sagrada Família in 1883, he changed the design completely, imbuing it with his own distinctive style. By 1889, he had completed the crypt, ringed by a series of chapels, one of which would become his own burial place. In 1904, he put the final touches to the Nativity Façade depicting the story of the Holy Family, Jesus, Mary and Joseph, amid a chorus of angels. The ‘Tragic Week’ in 1909 had a profound impact on Gaudí’s work and personality. He had moved into a house in the Güell Park that had been built as a showcase property for the estate. Gaudí stayed there during the anti-clerical protests and attacks on churches and convents, fearing for the safety of the Sagrada Família. The first of the basilica’s 18 bell towers, soaring to a height of 100 metres, was completed in 1925. That year, he moved from his house in the Güell Park into Sagrada Família, and lived inside the workshop of the basilica that was now his all-consuming project. On 7 June 1926, Gaudí was taking his daily walk to the Church of Sant Felip Neri for his daily prayers and confession. As he walked along the Gran Via de les Corts Catalanes, he was struck by a passing tram. With his shabby clothes and appearance, he was mistaken for a beggar and was left unconscious on the side of the street. Eventually, a police officer called a taxi and took him to the Hospital de la Santa Creu i de Sant Pau – another Modernista building, designed by Lluís Domènech i Montaner. But Gaudí received only basic care. By the time that the chaplain of the Sagrada Família, Father Mosén Gil Parés, recognised him the following day, Gaudí’s condition had deteriorated severely. He died 90 years ago on 10 June 1926 at the age of 73, and he was buried two days later in the crypt of Sagrada Família. Gaudí is regarded as the great master of Catalan Modernism, but his work goes beyond any one style or classification. His place in the history of architecture is that of a creative genius inspired by nature. He developed a style that attained technical perfection and high aesthetic value, and that bore the mark of his character. His study of nature translated into his use of ruled geometrical forms, and at an early stage he was also inspired by oriental arts from India, Persia and Japan. He was also influenced by Walter Pater, John Ruskin and William Morris, key figures in the Gothic Revival and Arts and Crafts movements in England. Gaudí conceived the interior of Sagrada Família as if it were a forest, with a set of tree-like columns divided into branches to support a structure of inter-twined vaults. He inclined the columns so they could better resist perpendicular pressure on their section. He also gave them a double-turn helicoidal shape (right turn and left turn), as in the branches and trunks of trees. This new technique allowed him to achieve his great architectural goal of perfecting and going beyond Gothic style. Gaudí’s first works included a set of lampposts for the Plaça Reial in Barcelona. In 1883-1888, he built the Casa Vicens for the stockbroker Manuel Vicens i Montaner. At the beginning of the 20th century, his main new project was the Park Güell (1900-1914). This garden complex on the hill of el Carmel in the Gràcia district was planned as a residential estate in the style of an English garden city. The project was unsuccessful – of the 60 plots the site was divided into, only one was sold. But the park entrances and service areas display Gaudí’s genius and put into practice many of his innovative structural solutions. The main entrance to the park has a building on each side, planned as a porter’s lodge and an office, and the site is surrounded by a stone and glazed-ceramic wall. These entrance buildings show Gaudí at the height of his creativity, and the dragon fountain has become a symbol of the park and one of Gaudí’s most recognised emblems. One of Gaudí’s largest and most striking works is the Casa Batlló (1904-1906). He was commissioned by Josep Batlló i Casanovas to renovate a house first built in 1875 by Emili Sala Cortés. Gaudí focused on the façade, the main floor, the patio and the roof, and built a fifth floor for the staff. The facade is of Montjuïc sandstone cut to create warped ruled surfaces; the columns are bone-shaped with vegetable decoration. Gaudí kept the rectangular shape of the balconies – with iron railings in the shape of masks – giving the rest of the façade an ascending undulating form. He also faced the facade with ceramic fragments of various colours (trencadís), which Gaudí obtained from the waste material of the Pelegrí glass works. His chimneys are a prominent feature on the roof, topped with conical caps, covered in clear glass in the centre and ceramics and a cylindrical turret with anagrams of Jesus, Mary and Joseph, and Gaudí’s trademark four-armed cross. However, his second most popular building in Barcelona is his Casa Milà or La Pedrera, built in 1906-1910 at Passeig de Gràcia Avenue for Pere Milà i Camps. Gaudí designed the house around two large, curved courtyards, with a structure of stone, brick and cast-iron columns and steel beams. The façade is built of limestone, apart from the upper level, which is covered in white tiles, evoking a snowy mountain. It has a total of five floors, plus a loft made entirely of catenary arches, as well as two large interior courtyards, one circular and one oval. The features include the staircases to the roof, topped with his four-armed cross, and the chimneys, covered in ceramics and with shapes that suggest mediaeval helmets. 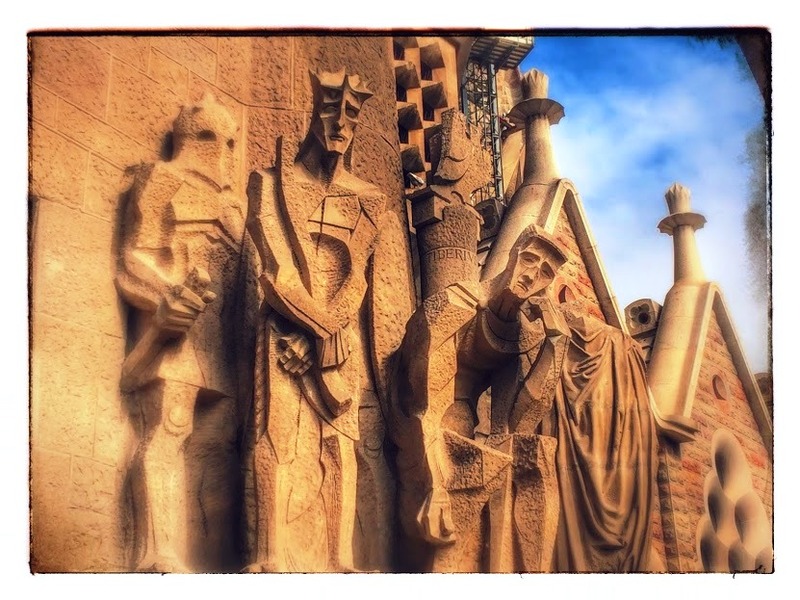 Work on Sagrada Família has been going on for over 130 years. 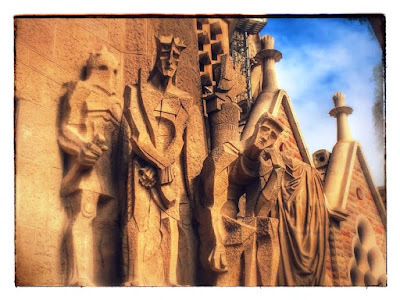 Josep Maria Subirachs, who took over from Gaudí, completed the Passion Façade, which draws both criticism and praise for its angular, severe and striking sculptures. The nave was finally completed on 31 December 2000. But Sagrada Família is not expected to be completed for another 10 years – in 2026, which marks the 100th anniversary of Gaudí’s death. Gaudí left a deep mark on 20th-century architecture. His admirers include Le Corbusier, and he has inspired many architects, including Santiago Calatrava and Frei Otto. A devout Catholic, his death before the Spanish Civil War means all Catalans and Spaniards are proud of his legacy. In 2003, the Vatican opened the beatification process which puts him on the road towards being canonised a saint. Canon Patrick Comerford lectures in the Church of Ireland Theological Institute. his feature was first published in June 2016 in the Church Review (Dublin and Glendalough) and the Diocesan Magazine (Cashel, Ferns and Ossory). This is the Second Sunday after Trinity [5 June 2016], and I am back in Lichfild for a short, overnight visit before travelling on to the Hayes Conference Centre in Swanwick, Derbyshire, for the annual residential meetings of the trustees and council of the Anglican mission agency, USPG. I caught the first flight from Dublin to Birmingham this morning, and I am staying at the Hedgehog Vintage Inn on the outskirts of Lichfield, with beautiful rolling Staffordshire countryside beside me, and sweeping views from the grounds out across Lichfield and south towards the three spires of Lichfield Cathedral. Later this morning, I hope to walk back down Beacon Street to the cathedral for the Choral Eucharist at 11 a.m., celebrated by the Dean of Lichfield, the Very Revd Adrian Dorber, and sung by the Boys’ and Men’s voices of the cathedral choir. The preacher this morning is Canon Dr Anthony Moore, who is the canon-in-residence this week. He is Vice-Dean and Canon for Liturgy and Formation, with responsibility for oversight of the Cathedral’s Choral Foundation and its musical and educational outreach work with schools, colleges and universities within the Diocese of Lichfield and the region. The setting this morning is the Communion Service in C and F by the Irish-born composer, Sir Charles Villiers Stanford (1852-1924). The motet is Grant me, O Lord, a setting by Benjamin Lamb, Director of Music at Lichfield Cathedral, of a prayer written by Samuel Johnson in his diary on Easter Day, 22 April 1764.